Johnny has a way with the ladies, but will his last date be with death? For free trips and a fat fee, Johnny Dollar descends into cases of missing money and missing men. But, what can he do when the bodies are walled up, washed up, and fallen down? When the jewels and the paintings are fake? And, when everything from trucks to trout to widows are on the loose? He'd better bring his gun. 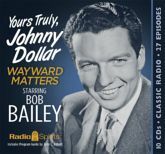 This collection features Bob Bailey in 27 half hour episodes, including three two-part storylines. John Dehner, Stacy Harris, Frank Nelson, Alan Reed, Virginia Gregg, Joe Kearns and many more are heard in these wayward matters. Includes a Program Guide by John C. Abbott.